Ten years ago, a terror attack aiming to kill hundreds of innocent holidaymakers failed because of a concrete door post and the actions of ordinary people who were at Glasgow Airport that day. In recent months the UK has seen a number of attacks in which vehicles have been used in an attempt to kill large numbers of people - but a decade ago the attack was unlike any other. It was also the first time Scotland had been targeted for a terrorist attack. A Jeep Cherokee laden with propane gas cylinders and petrol cans was driven at speed into the doors of the Glasgow Airport departure area on one of the busiest days of the year. At 15:11, 4,000 people were already inside the terminal and the departure halls were packed with passengers waiting to board flights on the first Saturday of the Scottish school summer holidays, when the car came smashing towards them. It was only a concrete pillar at the main door that stopped the Jeep causing a fireball in the departure hall and a horrendous tragedy. The SUV could not get into the main concourse where holidaymakers watched in horror. Inside the vehicle were Iraqi doctor Bilal Abdulla, 27, and 28-year-old engineer Kafeel Ahmed, who was born in India and grew up in Saudi Arabia. When the Jeep failed to explode, Abdulla threw petrol bombs from the passenger seat and Ahmed doused himself in petrol and set it alight. Then, as stunned holidaymakers began to run for their lives, Abdulla got out of the vehicle and attacked a policeman who had appeared on the scene. He was tackled by passers-by, including Alex McIlveen, a taxi driver who had just dropped off a fare when he saw the attack. As Mr McIlveen and others fought with Abdulla, his co-conspirator Ahmed got out of the Jeep, totally covered in flames, and went to the boot of the car. An off-duty police officer hosed the burning man with a fire extinguisher as he tried to open the boot of the car, which unknown to the officer contained gas canisters and petrol. Despite his severe burns Kafeel Ahmed carried on fighting as they tried to pull him away from the car. Alex McIlveen told a BBC documentary in 2008: "I was pure daft because I gave him a kick in the crotch. "He didnae flinch. He didnae move nor nothing. I gave him a good kick as well." McIlveen tore a tendon in his foot when he kicked Ahmed in the groin. Two police officers sprayed CS spray in Ahmed's eyes in order to subdue him but he continued to resist and it was Stephen Clarkson, who was at the airport to pick up family, who brought him to the ground with a blow to the chest. Mr Clarkson told BBC Scotland: "More or less as soon as he hit the ground the police were on top of him." Former detective David Swindle, who was in charge of the police operation on the day, told BBC Scotland: "If it had not been for the concrete pillar that vehicle could have been inside the airport and you could never imagine the casualties that would have happened there. "Looking at CCTV from inside the airport, where you see people running screaming in horror, you would never understand what could have happened there. "Thankfully only for the sake of that and the intervention of members of the public, who actually challenged these people, we will never know what could have happened." Det Supt Swindle added: "That was the first time a vehicle had been used as an attack of terror and it was in Scotland. There was always a belief it could never happen here. "It did happen and it was a shocking spectacular event that everyone in Scotland will remember." What happened to the bombers? Kafeel Ahmed suffered 90% burns in the attack but he did not die immediately. It was over a month before he was pronounced dead at the Royal Alexandra Hospital in Paisley. This was the same hospital in which Bilal Abdulla had worked prior to the attack. Abdulla was found guilty at Woolwich Crown Court in London of conspiracy to murder by planning car bomb attacks, with accomplice Ahmed. He was sentenced to at least 32 years in jail. Abdulla admitted in court that he was "a terrorist" as defined by English law. He went on to say he believed the British government and Army could equally be accused of terrorism for their actions in Iraq. But he added he had wanted to frighten people rather than murder them. The year before the attack, Ahmed gave a lecture about the injustices suffered by Muslims all over the world. Police found a hoard of jihadist material on his computer and he had listened to lectures by Osama bin Laden and other al-Qaeda figures. Why did they carry out the attack? The attack on Glasgow Airport appears to have been a response to the failure of two massive car bombs in London the day before. Abdulla and Ahmed are thought to have been planning the London bombings for months. They had driven to London in two cars packed with gas canisters, petrol and thousands of nails. The car were left outside Tiger Tiger nightclub, near Piccadilly Circus, and in nearby Cockspur Street in the city's West End. 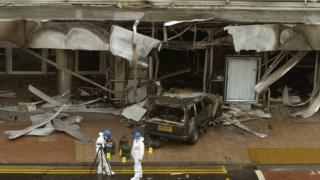 The plan was to detonate the bombs using a homemade device of a syringe full of matches and a mobile phone but the cars failed to explode and the attackers knew the police were on their trail. It was at this point that Abdulla and Ahmed decided to launch a suicide attack on Glasgow Airport. During Abdulla's court case, prosecutors said that in both attacks it was good fortune alone that there had been no loss of innocent life. Speaking about the London attacks, the judge said: "Your murderous intent was best shown by the obstructing of the safety mechanisms on two of the cylinders and by the 800-plus nails in one car and 1,000 in the second, designed to do nothing else but constitute a deadly form of shrapnel to maim, injure and kill." He added: "You were both undeterred and immediately put the second attack into effect, which had probably been designed as the grand finale of your conspiracy."